Carlos N. Chantre, 80, passed away on Tuesday, October 23, 2018 at Overlook Medical Center, Summit, NJ. He was born in Trinta, Guarda, Portugal and came to the United States in 1969 and resided in the Ironbound Section of Newark before moving to Mountainside, NJ. 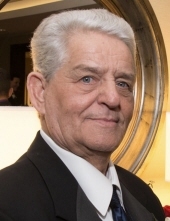 Carlos worked for Kenilworth Consolidated Fencing, Co. and worked construction for many years. He was a machinist at Pechter’s Bakery of Harrison, NJ. He was a member of the Portuguese Sport Club of Newark. Beloved husband of Etelvina Fonseca Morais Chantre; devoted and loving father of Ana Chantre Franzen and her husband Todd, Celia Chantre Saldida; dear brother of Manuel Chantre, Rosa Chantre, Antonio Chantre, Laurinda Chantre, Maria Jose Chantre and the late Jose Chantre and Natividade Lopes; cherished grandfather of Nicole Sardo and her husband Paulo, Michael Saldida and his fiancé JoAnn Simoes, Alexa Saldida; great-grandfather of Auriana Sardo. Also survived by many dear nieces, nephews and friends. The Funeral for Carlos will be held on Saturday, October 27th at 8:30 am at the Buyus Funeral Home, 426 Lafayette Street at Wilson Avenue, Newark, NJ. Thence to Our Lady of Fatima Church, Newark, where at 9:30 am the Funeral Mass will be offered. Relatives and friends are welcome to attend. Visitation for Carlos will be on Friday, October 26th from 6 - 9 pm. donatenow.heart.org‎, would be greatly appreciated. To send flowers or a remembrance gift to the family of Carlos N. Chantre, please visit our Tribute Store. "Email Address" would like to share the life celebration of Carlos N. Chantre. Click on the "link" to go to share a favorite memory or leave a condolence message for the family.